which enables you to download online movies from all video websites and video-sharing sites. Fixed the problem that the program crashed when transcoding. Supports all video websites and video-sharing sites such as YouTube, Netflix, Hulu, Facebook, IMDB, VEVO, AOL, iFilm, My space, Blip.tv, Vimeo, Video.google, Movieweb, Video.yahoo¹, etc for download. Extracts all static links of the current webpage to download your desired contents conveniently. Converts the downloaded and captured streaming videos to various video formats. Supports for downloading and converting one video file simultaneously. Save your desired types of files. The 1-Click Download and 1-Click Capture interfaces enable new users to download and capture streaming videos quite easily. Built-in crash-proof web browser adopting the multi-process technology. Reopens recently closed website pages. 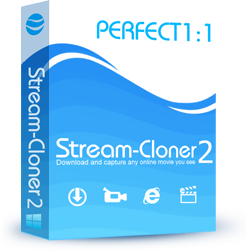 Stream-Cloner 2 is an all-in-one leading stream downloader with brand-new interfaces and high speed to download videos from all video websites and video-sharing sites including YouTube, Netflix, Hulu, Facebook, VEVO, Myspace, Dailymotion¹, etc. It enables you to download online movies, streaming videos, audio files, pictures, etc from the Internet and capture anything on the PC whenever you want. With Stream-Cloner 2, the downloaded and captured videos can be converted to video and audio formats compatible with popular media devices. Stream-Cloner 2 can extract all static links of your current webpage so that you can select your desired content URLs to download conveniently. Besides, you can add a category manually to save your favorite finished tasks independently. The downloaded/captured/converted video files can be easily played back with the built-in video player. With this easy-to-use tool, even a novice can accomplish the download/capture tasks by using the 1-Click interface. The brand-new interfaces enable you to download/capture streaming videos more conveniently. The 1-Click Download interface enables new users to download online movies quite easily. Supports all video websites and video-sharing sites to download YouTube, Netflix, Hulu, Facebook, IMDB, VEVO, AOL, iFilm, My space, Blip.tv, Vimeo, Video.google, Movieweb, Video.yahoo¹, etc. Drags a region for capture manually. Picks an object for capture automatically. The 1-Click Capture interface enables new users to capture videos quite easily. Supports all video websites including Netflix, iTunes, Redbox¹, etc for capture. Converts the downloaded online movies and captured streaming video/audio to various video formats such as AVI, MKV, MP4, MOV, 3GP, ASF, WMV, MPG, TS, VOB, FLV, SWF and audio formats such as MP3, MP2, AC3, OGG, AAC, M4A, WMA, WAV, AIFF, AU, etc for enjoying on popular media devices. Supports media devices such as iPod, iPhone, iPhone 4, iPhone 5, iPad, iPad 2, Tablet PC, PSP, PS3, Zune, Mobile Phone, GPhone, Smart Phone, Xbox 360, etc. Add a category manually to save your favorite finished tasks independently. Set the homepage of the internal browser. Select whether to show the suspension download prompt on the flash player. Set the target capture window to topmost when capturing. ¹: Trade names including YouTube, Hulu, Facebook, IMDB, VEVO, AOL, iFilm, My space, Blip.tv, Vimeo, Video.google, Movieweb, Video.yahoo, Netflix, iTunes, Redbox and others used above are the respective trademarks of their owners.